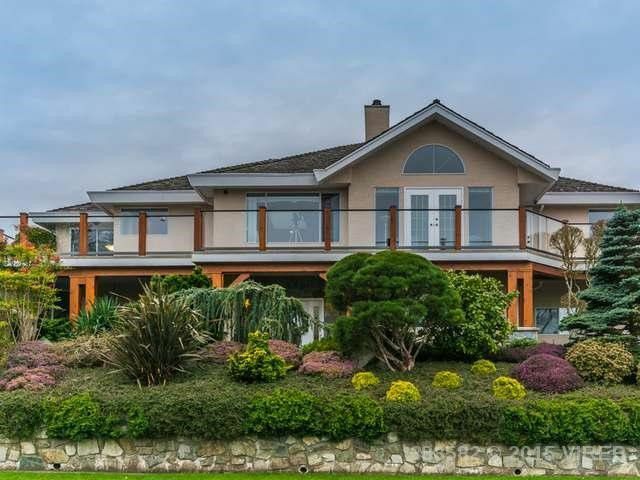 North Nanaimo home offers great ocean and mountain views. Beautifully landscaped, large decks off the front and back. Several recent updates, large entry, with living rm and dining rm having a 3 way fireplace. Spacious kitchen, new countertops, many cupboards, oak cabinets. The family rm has a rock fireplace & access to front & back decks. Hardwood floors through most of this level. The master has walk in closet, ensuite with stone accent, jetted tub, separate shower and make up mirror. Living rm, dining rm, kitchen & master all face the ocean. 2 more bdrms on this level and remodeled 4 pce bath. Downstairs, nice sized den, another bdrm, family rm, laundry rm, 4 pc bath. Oversized garage with workshop area, enclosed garden room. Storage under back deck. Yard fully irrigated, backyard fully fenced, plenty of parking, security system, built in vacuum & phantom screen doors..